Leaving Wyndham, it’s a sealed road all the way to the El Questro turn off. 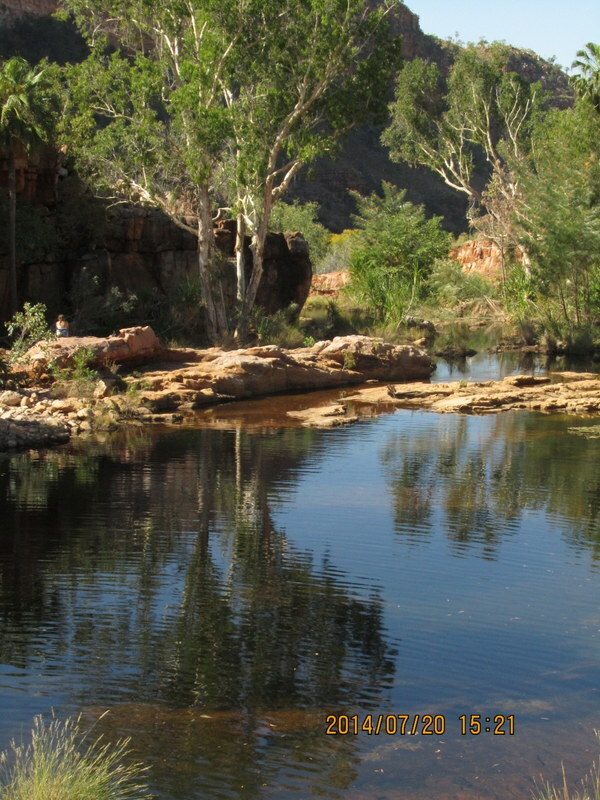 El Questro describes itself as “wilderness”. It’s a dubious claim given it is still an active cattle station, leaving aside the tourist facilities. For many wilderness enthusiasts it is anything but wilderness but, no doubt, many Aborigines would view it differently since in their view all of Australia would be managed land. After the turn off, it’s about an hour down a dirt road to the main station complex, although the homestead is elsewhere. The place is heaving as it is still school holidays and a weekend to boot, with many visitors from Kununurra. We find a campsite and settle in for the evening. The Royals from Kununurra are also here, as are our Kiwi friends from Purnululu. This is to be a pattern repeated with others throughout the trip. Dinner preparation is down to one burner on the gas stove, as the other, which was already about as much use as the proverbial mammary glands on a bull, has given up completely. Horton and Harris, bush mechanics start to pull it apart but after a while I lose interest. Kaylee and I decide that breakfast at the restaurant is of more interest than trying to fix the stove. Eggs and pancakes beckon. In our absence the camp supervisor comes around and Roger is able to get detailed jet removal and cleaning instructions. Apparently ours is a common problem and Roger tells us that our mutual friend, Hugh, who travelled around the north, several years ago, with his family, became a global expert on fixing gas stoves as a result of the persistent impact of red dust on the gas valves. We return after breakfast to the news that the stove has been fixed. Roger is now the new Hugh. There is a general evacuation of the camp ground. The weekend warriors are returning to Kununurra and Wyndham and many others are homeward bound for the start of school term. They abandon their firewood piles so we disperse around all the abandoned fireplaces and as a result of our scavenging accumulate an Everest like pile of firewood for our remaining two evenings. At 9 am we set off to walk to Champagne Springs about two hours away. 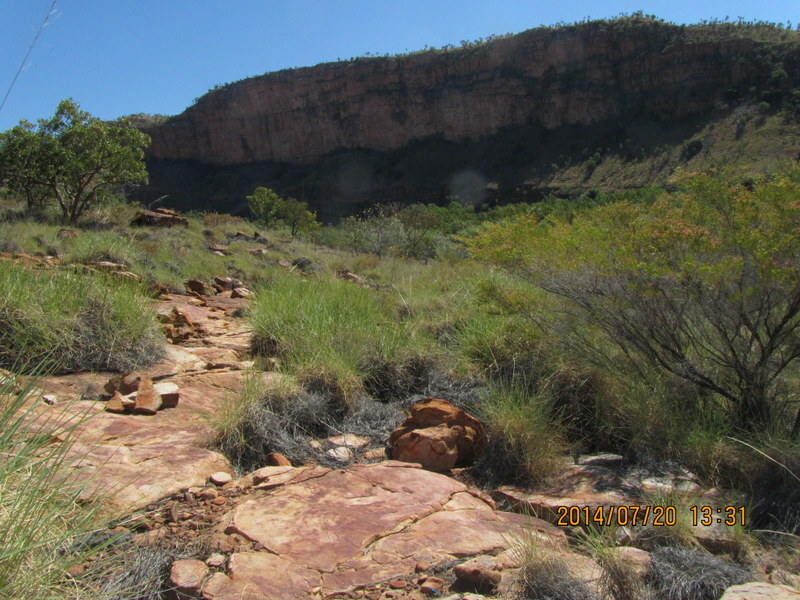 It’s a walk that starts along the banks of the Pentecost River and then enters a stunning grevillea forest. 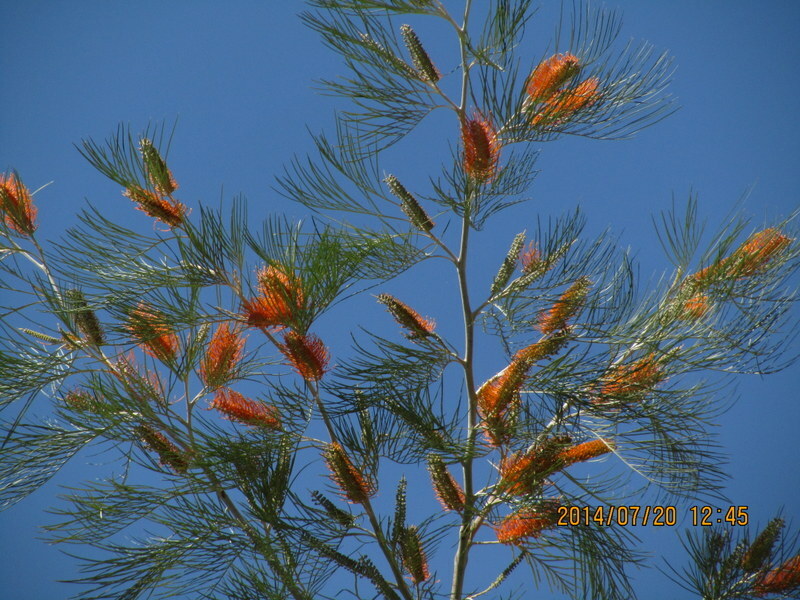 We pass silently along a flower and leaf strewn path that threads its way through six metre flowering grevilleas. The forest is filled with the noise and sight of birds of all sizes, calls and colours. None of us have ever seen a patch of forest quite so completely dominated by flowering grevilleas. 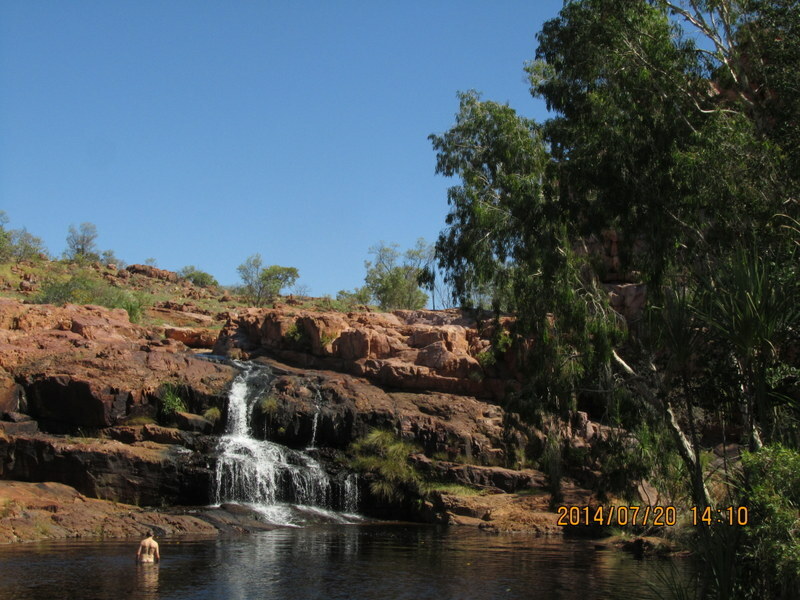 We emerge from the grevilleas into a rock and spinifex landscape dominated by soaring gorge walls and, twenty minutes later, arrive at a clear fast flowing creek, with a series of rapids and waterfalls. We have it entirely to ourselves. It appears that a two hour walk is a bridge too far for most visitors. On our second morning we head off to Zebedee hot (warm) springs. On arriving at the springs we discover that disaster has struck. I have managed to abandon my thongs at the El Questro main car park and, if we can’t recover them, I am down to just boots for the next couple of weeks. Australia and the globe, generally, are strewn with random items of personal possessions which I have been managing to spread around the world with abandon for years. Glasses, wallets, combs, hats, phones, pens, daypacks, shoes, clean and dirty laundry, computers. No item is too big or too expensive for me to lose. Zebedee Springs are a beautiful spot but suffering severe visitor pressures and heavily populated by grey nomads many of whom are very overweight. To get around one has to walk and climb very carefully over very sharp rocks. There is an element of having emerged into some sort of heavily choreographed dance routine, but performed at snails’ pace, as posses of old and not so old visitors perform a staccato circulation around the various pools. When we arrive there are more than 50 people in the 1000 square metres that constitute the area of the springs. The best spot is right at the top where the springs emerge. Roger, Jill and I laze around in the top pool and I then go to fetch Kaylee who is in one of the lower pools. As we ascend the rocks, she calls out to me and I pirouette gracefully on the crest of on the our nation’s most slippery rocks, elegantly sliding down it, to land horizontally with my head on one rock, my hip on another and my hand on a third. Fortunately my pride suffers more than any body part since, so far as I can see, the collection of 80 year olds have managed to negotiate the pools without incident. As we leave I manage to abandon my hat and sunnies on the rocks and they are rescued by Jill. I am on about strike six so far as lost items are concerned and I continue to be banned from care of car keys. In the afternoon we head for El Questro Gorge. 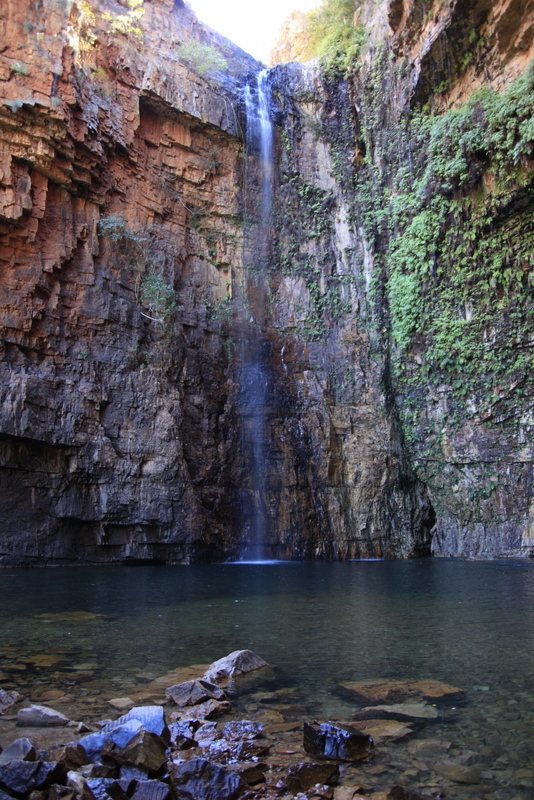 It is an easy hours walk up to the Gorge to the first waterfall. The gorge is cool and narrow, quite different from many of the others we have visited. The walk above the first falls is a further 40 minutes, but we go no further. The end of the gorge is heavily populated and, in the absence of more heroic feats to perform, I leap to the rescue of a plastic floating baby which has escaped the grasp of two young girls. I bask in the universal acclaim of a 3 and a 5 year old, which redeems somewhat the opprobrium which has been heaped on me due to my amnesia about my various possessions. A qu ick swim and lunch and we head back to the camp. Jill has decided not to come up the gorge with us and has stayed in the lower part of the river to do some drawing. When Roger, Kaylee and I all arrive back at the car park without Jill, Roger has to go off on a search and rescue mission. This is normally accomplished, we are told, through a series of whistles which they have allegedly perfected for just such a situation. It seems fortunate that Jill is not really lost since the system clearly not work even when they are just five metres apart. It would be entirely useless in more critical situations. Jill appears to want Roger to find her by some form of symbiotic process since, seeing Roger walking past, she stops whistling and waits for prescience to set in. Jill on the other hand blames Roger for not listening. All is sweetness and light. We return to El Questro Central. My thongs are continuing to reside where I left them that morning. Kaylee is not amused and berates me for my carelessness. When I suggest that my leaving the sandals was due to her distracting me at the critical moment when I was due to load my sandals into the vehicle the lack of amusement turns to assault. My pleas about early onset Alzheimers are ignored. Being Saturday night, decide to have dinner at the restaurant. The big question of the night is did the Swans beat Hawthorn? We interrogate each of the waiters, in turn, but no one knows and the General Manager, who is a footie fanatic, has knocked off. On our return to our camp the question of the week is still unresolved. Somewhat jokingly, I despatch Jill to ask nearby campers to put us out of our misery. But she takes me seriously and returns to report it is a split round and the match is not for another week. Kaylee decides on the second afternoon that she wants to go trail riding on our final morning and I agree to accompany her. At 6 am we stagger forth for our 7 am start. There are 10 of us plus the two guides, Laura and Christian, who run this business and another one near Mansfield in Victoria where they have an additional 55 horses. We set off along the trail. Having being used to riding my friend Lizzie Clay’s horses on which I have been, variously, thrown, nearly decapitated and have witnessed another friend being rolled on by her horse it is a little lacking in excitement. If my horse was any more docile it would be dead. When I drop the reins and remove my helmet in order to remove my jumper, I receive a stiff dressing down from Laura. She apparently believes it is possible to fall off a lounge suite and break ones neck because riding these horses is about as risky. On our return to camp we discover Roger has had a partially sleepless night having woken, with a scream, from a bad dream in which he has to rescue me from the attack of a large Irish wolfhound or similar. We are unable to determine the cause of the nightmare, and my suggestion that the wolfhound might represent Kaylee does not meet with universal approval. We are packed and we head for Emma Gorge. We have just crossed the Pentecost River and the occupants of the car behind start leaning on their horn. Roger tries to ignore them but after a while he pulls up. Someone has failed to lock the rear compartment and Jill’s walking boots have fallen out. Roger is blamed because we have decided to assign Roger the blame for everything that goes wrong. Emma Gorge is another shortish walk up the creek leaving from the Resort where we take note of how the idle rich pass their Kimberley holidays, pandered with spas, massages, restaurants and auto massage water beds and silk sheets. We, on the other hand, who are down among the dust are increasingly blending with the landscape. We all have complete sets of red dust clothes, shoes and hair. The vehicle is red, the sheets are turning reddish and the cameras, phones, iPads and all other electronic devices are increasingly covered with a miasma of red. Emma Creek narrows out into a steep-sided gorge and terminates into a giant plunge pool which gets no sun at all in winter. The water is cold but, off to the right, as you face the waterfall there is a miniature sculpted rock bowl smoothed to a marble finish. This pool is fed by a warm spring which wards off hypothermia. It is just large enough for one or two people to get in. Fifty metres downstream is another warmer pool, the Turquoise Pool, and Kaylee and I leave the sun-phobic among us to the cool pool. Lunch brings us back to the resort and then we leave for the Mitchell Plateau and falls. I think we did meet once James, but if your memory is anything like mine normally is then you may have forgotten. This country is great and Kaylee and I are managing to survive our two months together with good humour and reasonable equanimity.